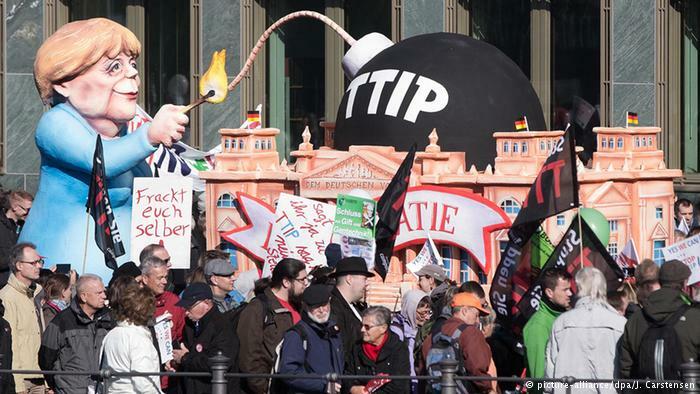 On the eve of a visit by U.S. President Barack Obama, tens of thousands of people took to the streets in Germany on Saturday to voice emphatic opposition to the Transatlantic Trade and Investment Partnership agreement (TTIP), a deal they argue benefits global capitalism and corporate elites at the expense of the public good and local democracy. With a 1960’s “Summer of Love” theme informing the march, many participants grooved under banners reading “Freie Liebe – Statt Freihandel” (Free Love – Not Free Trade) as organizers estimated 90,000 people in attendance. 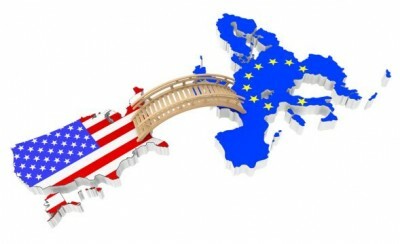 With Obama arriving to meet with German Chancellor Angela Merkel on Sunday to push for the deal, the expression of dissent in the city of Hannover matches recent reportingexplaining how support for the TTIP has fallen on both sides of the Atlantic. On Thursday, a YouGov poll showed only 17 percent of Germans support passage of the deal, down from 55 percent just two years ago. With a focus on Obama’s arrival, one group dropped a large banner in the city reading “Yes We Can — Stop TTIP!” – utilizing the president’s famous 2008 campaign slogan. On Friday, Obama was in the UK where he pressed upon his host, Conservative Prime Minister David Cameron, the need for European leaders to rally behind the deal. 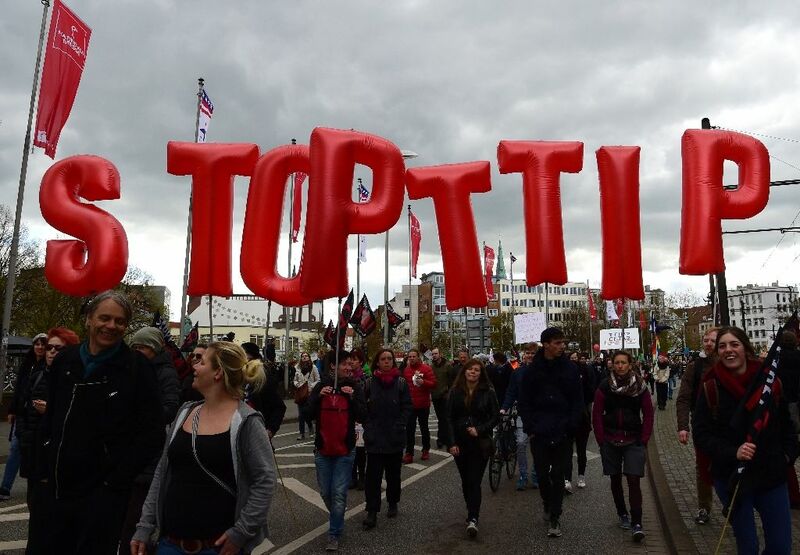 Though Merkel has expressed her support for TTIP, her office has acknowledged that public opposition remains strong. As the whistle-blowing crowd moved through Hanover in unseasonably cold weather, one banner reading “Don’t give TTIP a chance” featured the image of a bull tagged “privatisation” and a cow branded “democracy”. A mock coffin was emblazoned with the words “Democracy killed by money”. Dieter Berlin, a 73-year-old pensioner, attended the rally with his wife Hanna, waving a banner reading “No GMOs on our plates” in a reference to genetically modified foods. “We want to keep our educational standards, not adopt the American educational system. And we want to hold onto our environmental standards too,” he said.